There’s been a lot of talk over the last week or so about the most popular Twitter platforms to use. Up until now I’ve been using the basic web interface through Twitter.com. I also tried a Firefox extension called TwitterFox. While some may like it, I found that it slowed down my browsing speed for some reason. While there seems to be a new platform to use Twitter coming out every couple of days, the jury has declared TweetDeck to be the most popular. According to this list, it’s the #1 application to use while sending out tweets. As you can see above, there are three categories. The first is the general feed column that lists updates from all of those you happen to be following. You can choose how often these updates refresh in the options menu. 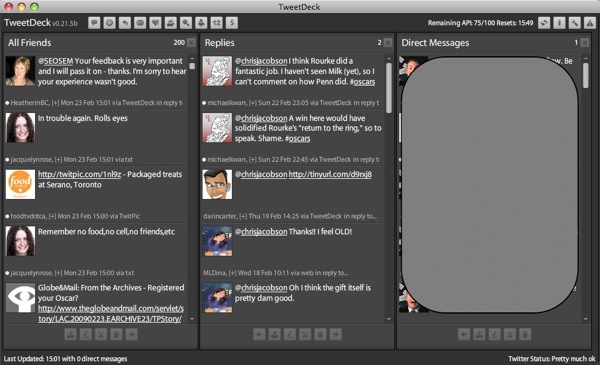 You can also choose to change TweetDeck’s colours, if the darker shades aren’t particularly your thing. The middle column shows all of your @replies sent to you from your followers. The third column holds your private DMs (direct messages). You can also substitute any of these columns for groups, in which you can choose to add certain followers into categories. If you’re following hundreds or even thousands of people, you may want to put your close friends or family into a group to only get their updates in a dedicated column. After using TweetDeck for two full days on my personal account, I’m quite impressed. It’s much easier to keep track of everything rather than on the web. Another bit of Twitter news this week was the fact that SMS updates have been restored for Canadian users. Back in November, Twitter discontinued them because it was too expensive to deal with current wireless providers. If you’re not already following @chrisjacobson on Twitter, please do so. Firefox keeps coming out with more and more extensions that keep making is more and more popular, and with the huge spike of Twitter users, I’m sure a lot of people will be using this plugin. Otherwise it has the best functionality of all twitter clients. Love the tweetdeck, i think most of the resource problems are on PC’s, seems to be nearly error free on the Mac. I’m a fan of TweetDeck, but I hate how it’s always freezing up on me. However, it seems to have stabilized a little bit since the update of Adobe Air last week, so I’m hopeful that problem will have ceased by now.